Obituary for Nancy A. 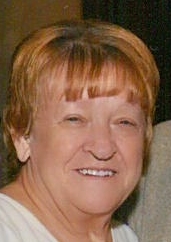 (Burk) Warrick | Hughes Funeral Home, Inc.
Age 66, of Spring Garden, at her home, surrounded by her family, passed away on Sunday, September 16, 2018. Beloved wife of 50 years of C. Lee Warrick, Sr.; loving mother of Carol (Dave) Saylor of Mars, and Lee, Jr. (Jennine) Warrick of Allison Park; dear grandmother of Alex, Victoria, Olivia, Seairra, and Leah; dear step-grandmother of Steve, Becky, Josh, and Dina; dear sister of John and Thomas Burk, Jessie Sutton, and Judy Massel; also survived by many loving nieces and nephews. Family and friends will be received on Wednesday only from 2:00 to 4:00 and 7:00 to 9:00 PM at the Hughes Funeral Home, Inc, 1501 Lowrie St., PGH PA 15212, Troy Hill, where a funeral service will be celebrated on Thursday at 11 AM.